Lois P. Jones’s poetry and photographs have been published in American Poetry Journal, Raven Chronicles, qarrtsiluni, and other print and on-line journals in the U.S. and abroad. Since 2008 she has hosted KPFK’s long-running radio series in Los Angeles, Poet’s Cafe (90.7 FM Pacifica Radio). Lois co-produces Moonday West and is a co-host of Moonday’s east side poetry reading at Flintridge Books. She is the Poetry Editor of Kyoto Journal and a 2009/2010 Pushcart Nominee as well as a 2010/2011 nominee for Best New Poets. In 2010 her poem “Ouija” was selected as Poem of the Year by judge Dana Goodyear. Terrific photo Lois. 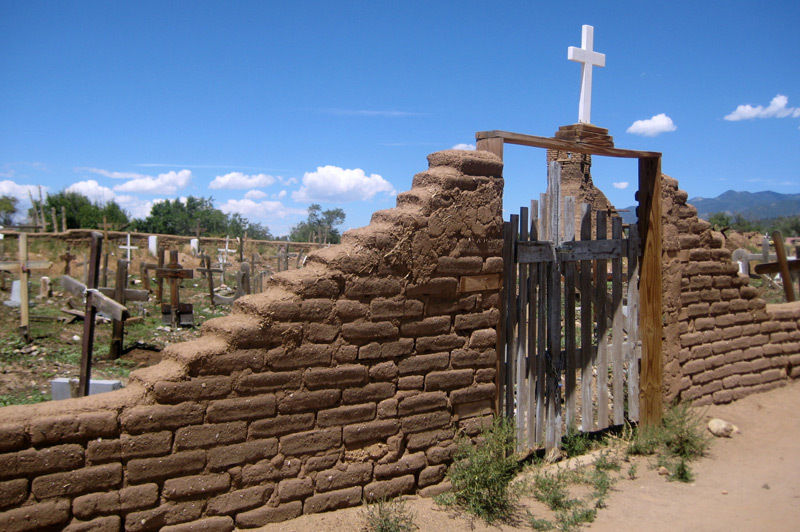 Love the sound of “desert dead.” The contrast in color between the sky, the white cross and clouds and the adobe? is spectacular. Thanks Judith. You know if Magritte were mayor of a city, this would have been it. Such a surreality to the light and stark contrasts. Taos is really a photographer’s heaven. Another good photo – thanks qarrtsiluni folks. So clean, this one. Thanks for taking the time to comment Tony! Clean is good. There’s a lot going on in this photo. I’m enjoying it a lot, and shall show it to my husband. Olivia, it is a community isn’t it? Well that’s as long as the spirits stick around. Depending on which way your faith blows some may have moved to a heaven or gone to their next life. Then there are those who don’t know what to do so they hang out at the graveyard waiting for the next train. Personally I’ve always thought “rest in peace” was an impossibility. Can we really imagine someone eternally resting (and yet conscious) in a graveyard? I don’t know about you, but I don’t plan on spending the rest of eternity communing with worms and dirt. Graveyards are for the living and so are fences as you aptly point out. I’m pleased you enjoyed this and that it provided a place to ponder. Thanks very much.